Memories of Merrywood Girls’ School, the old swimming pool and saving Filwood fields were some of the stories told about Knowle West at the April Green Mapping Session… Members of the group drew a map of the area and pictures to illustrate their stories before recording them to put on the local map of the area. Others who had recorded their stories at a previous session learned how to edit them with Apple’s Garageband and to upload them onto our own green map. 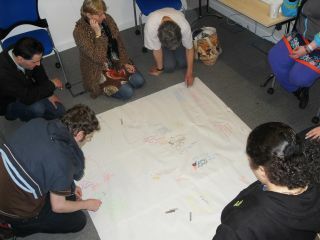 A story teller inspired the Green Mapping Group to swap tales about Knowle West from long ago at their March session. David Mowat from Bristol Ecoshows helped the group to map some of their stories about the local area onto paper as well as recording them on dictaphones. 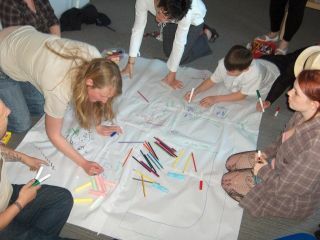 Participant Becky Thompson said: “I loved the session. The best part was joining in with the storytelling, drawing the map and allowing free flow imagination. I learned new skills telling stories to the group…” There was also a visit from resident artist Justin Quinnell who gave out pinhole cameras made from old beer cans and explained how to set them up. The cameras record the passage of the sun over several months and are being distributed throughout Knowle West. The photos are here. The team also spoke to Steve Parry from GreenBristol about the forthcoming study trip to Budapest in May to link with our three Partners creating their own green maps. 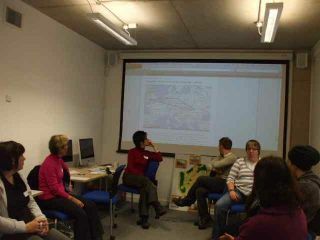 On Thursday 25th February thirteen Knowle West green mappers learnt about the up and coming euro trips. The group looked very keen indeed. They also learnt about how to add posts to the 4BsHive blog- techies ahoy! The rest of the group tried to set up yahoo accounts so that they could access the Open Green Mapping software- unfortunately Yahoo let us down! The Knowle West Green Mapping group met recently for their first workshop to find out more about the 4BsHive – especially the three overseas study visits this year. The first will be to Budapest in May. 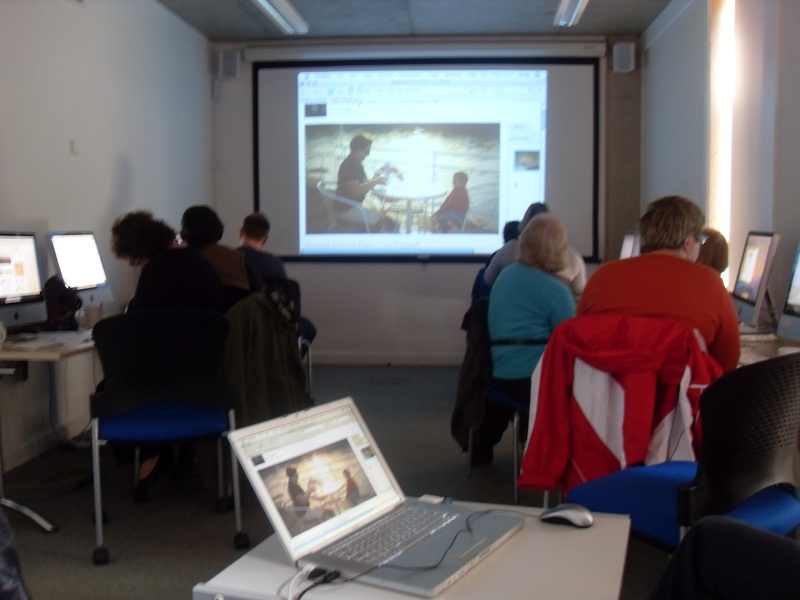 They looked at ways of mapping Knowle West using different media resources, such as photos and movies from cameras or mobile phones. Although some of the tech kit went wrong, cake kept everyone in good humour. The session ended on a high, with members being excited about the forthcoming learning and the prospect of sharing trips to Europe. After 4 days of action packed mapping fun, we said good bye to our 20 European visitors. Local people shared ideas and exchanged information with the visitors from Germany, Romania and Hungary about our area. 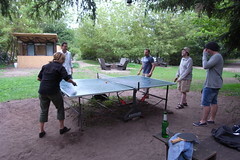 Most of the action was hosted by KWMC: film screenings with talks and workshops from local environmental campaigners. The highlight was on Friday, National Get Online day, where the visitors went out with local people to explore the area, and using different media tools documented Knowle West. All the content gathered on the day was uploaded to the Knowle West Green Map – a community resource that was originally put together by local people. The project is called the 4BsHive as each cities name starts with B and the idea is we all work as a colony. So the visit wouldn’t have been complete without a trip to see some bee hives! Lawrence Western Community Farm very kindly hosted a visit for us, giving us a taster bee keeping session with honey treats to boot! See the slideshow: Welcoming our European friends to the Bristol Visit.